For many bio-pharma research labs, cell banks, biorepositories and other laboratories involved in the biopreservation of samples in liquid nitrogen and ultra-low temperature freezers, the labelling of frozen vials is a considerable challenge. 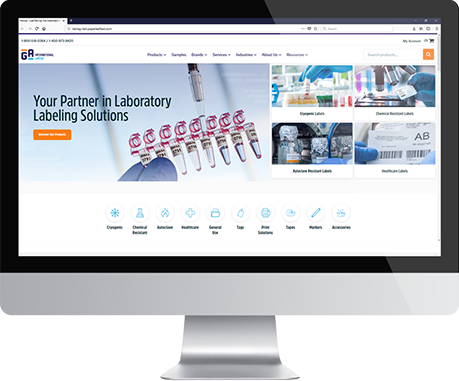 The obstacle is that the vast majority of cryogenic labels cannot stick to already frozen containers due to the solidification of their adhesive upon contact with a cryogenically frozen surface. At the same time, vials containing biological materials cannot be warmed-up due to the temperature sensitivity of their contents. In most cases, the re-labeling of these vials has to be done below -70ºC so as not to compromise the viability of the frozen cells. 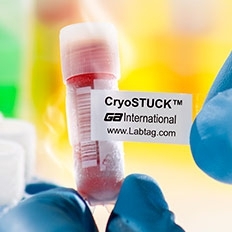 In order to help with this task, GA International developed a novel, unique cryo label called CryoSTUCK® that can stick to already frozen vials at -80ºC. They are coated with a special adhesive that does not solidify upon contact with a frozen substrate. As so, they can be successfully applied to frozen containers and put back inside liquid nitrogen tanks or -80ºC freezers for further preservation, even for decades. A distinct feature was implemented in a number of these CryoSTUCK® to allow them to completely cover-up frozen vial labels that are now outdated. 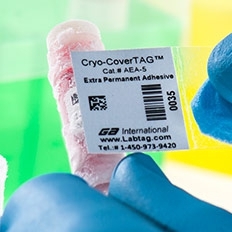 These opaque “cover-up” cryo labels are called CoverTAG™. They are designed to completely obscure existing labels and hide their obsolete information, preventing them from being seen through. They are ideal for re-labelling frozen vials when removal of the existing label is not possible. For correct functionality, CryoSTUCK® and CoverTAG™ labels must have an overlap of 3mm or more. Once applied with clear overlap, they are waterproof and able to withstand multiple freeze-thaw cycles. They can also be used for dry-ice storage and transportation. CryoSTUCK® and CoverTAG™ can be printed using standard brands of thermal transfer barcode printers such as SATO, Printronix, CAB, Zebra, Intermec, Datamax O’Neil, Citizen, Cognitive, Brady (selected models) and others. Recommended thermal transfer ribbons: RR-Class resin ribbons. They are also compatible with permanent markers such as our SM-1 cryomarker. 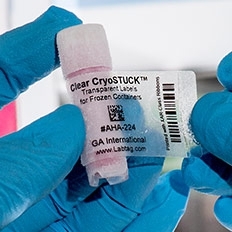 These unique labels can provide a perfect solution to many laboratories involved in long-term bio preservation of samples such as cord blood banks, cell banks, tissue banks, seed banks, sperm banks and other cryogenic storage facilities in biomedical and veterinary fields.